Vodka's neutral flavor and amaretto's sweet almond flavor make them a delightful pairing. 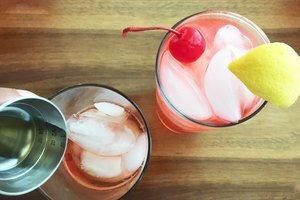 These two spirits are the building blocks of several cocktails with mixers like fruit juice or coffee. Most amaretto sours are extremely sweet, thanks to bottled sour mix. Skip that and mix your own cocktail to achieve the perfect balance of sour, sweet, and boozy. Fill a shaker with ice, then pour 1 part amaretto, 1 part vodka, 1 part simple syrup (adjust to taste) and 1/4 part lemon or lime juice. Shake, then strain into a rocks glass and serve. Amaretto-cranberry punch is ideal for summer gatherings because you can mix a large batch the day before and keep it in the refrigerator until ready to serve. The amaretto and vodka soften the tartness of the cranberry juice, lending a subtle nutty undertone. In a large pitcher, mix 2 parts cranberry juice, 1 part vodka, 1/2 part amaretto, and a generous splash of orange juice. Mix thoroughly. When you're ready to serve, shake the punch with ice, pour into glasses and garnish with orange wedges. The bocce ball is the screwdriver's more refined cousin. Amaretto adds a slightly bitter note to the sweetness of vodka and orange juice. A dash or two of Angostura bitters highlights the almond flavor. Fill a highball glass with ice, then pour in 1 part amaretto and 1 to 3 parts vodka, depending on how strong you like your cocktails. Fill the glass with orange juice, and top with a dash or two of Angostura bitters. For a cocktail that's perfect for a lazy weekend, try adding a kick to your coffee. Mix equal parts cocoa and sugar in the bottom of a large coffee mug. Pour 1/4 cup hot coffee over the mixture and stir to dissolve the sugar. Add 1 part amaretto and 1/2 part vodka and stir. Fill the cup with hot coffee, then top with whipped cream and a sprinkling of cocoa powder. 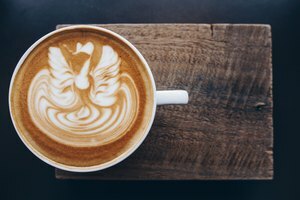 As the whipped cream melts into the coffee, the bitterness of the coffee and chocolate balances with the sweet almond of the amaretto—a creamy cocktail worthy of brunch.